How to Select Page Order for your HTML5 and flash online magazines, newspapers & e-books? I want to use the last page as the cover of my book and a middle page as the back cover. Is there any way to change the current page order of my HTML5 and flash e-books? It is very easy to change and select page order for your HTML5 and flash magazines, newspapers and e-books with the help of A-PDF Flipbook Maker. This page flip software will not only help you convert PDF to page flipping HTML5 and flash online magazines or e-books, but also provide you with a Page Manager that enables you to change the current page order of your book. First, you should import your PDF file. Second, in the Design interface, click "View" at the left top, and in the drop-down list, click "Page Manager" and the Page Panel will pop up on the right. And you can click to select a page and then click "Up" or "Down" button to rearrange the page order for your book. And you can delete pages or add new pages for the book. 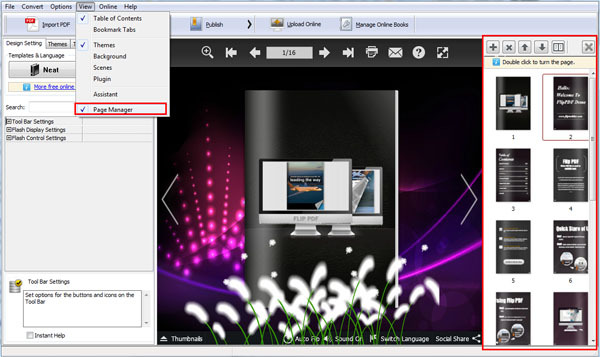 Third, click "Apply Change" button to save the settings and publish the HTML5 and flash flip book.